Fairs in Sorrento and Amalfi Coast. From April 25 to April 28 don't miss the chance to visit the "Second Hand Market", a fair of used things and handmade object located in the exhibition area of the Shrine. 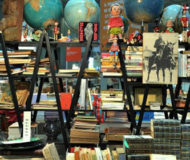 Description: From April 25 to April 28 don't miss the chance to visit the "Second Hand Market", a fair of used things and handmade object located in the exhibition area of the Shrine.